The Tower is scheduled to be delivered ahead of Expo 2020 starting in October of that year. The foundations have well and truly been laid for the rise of Dubai’s newest – and tallest – skyscraper. 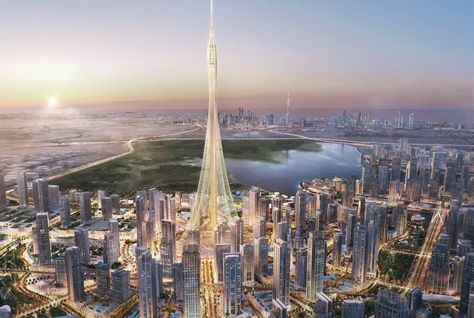 On Monday, the pile foundations for the global icon, The Tower, were deemed complete by its developers Emaar Properties and Dubai Holding, and in the coming days, the first structural facets of the building will be visible. Situated down at the Dubai Creek Harbour, several dedicated teams are already on-site to accelerate the development work of The Tower, which is scheduled to be delivered ahead of Expo 2020 starting in October of that year. His Highness Sheikh Mohammed bin Rashid Al Maktoum, Vice-President and Prime Minister of the UAE and Ruler of Dubai, had laid the foundation stone for the tower at the official ground breaking ceremony in October 2016. At a cost of $1 billion to build, the six square kilometre master-planned community will be only a ten-minute drive from the Dubai International Airport. Among The Tower’s features are The Pinnacle Room and VIP Observation Garden Decks that recreate the splendour of the ‘Hanging Gardens of Babylon,’ one of the Seven Wonders of the Ancient World. With its latest construction phase on track, Emaar has set a new world-first with the foundation work for The Tower. The pile was tested to a load of over 36,000 tonnes – the maximum carried by a single foundation pile to date – and a statement on its strength and durability. More than 145 barrette piles have been used to form the foundation for The Tower at the Dubai Creek Harbour, designed by Spanish-Swiss architect Santiago Calatrava Valls. Overlooking the Downtown Dubai skyline, the soon-to-be skyscraper adds an “incredible economic value to Dubai Creek Harbour” where Emaar has unveiled several residential projects including Creek Gate, Harbour Gate, The Cove, Dubai Creek Residences, Creekside 18, Harbour Views and Creek Horizon homes. “All have gained strong investor interest from the region and international markets,” the company said in a Press statement. Other features of The Tower include 679 million sq metres of residential space; 851,000 sq metres of commercial property; 22 hotels with 4,400 rooms; and 11.1 million sq metres of retail.